The December 4, 1932 San Antonio Light (San Antonio, TX) ran this illustration accompanying a piece titled, "Looking Ahead Another 50 Years." TELEVISION -- The husband at home in bed is able to sweep the mechanical eye through the shopping district and see what his wife is doing. He also has all sorts of appliances for supplying almost anything he needs, including a robot valet, who is seen approaching with his master's suit of clothes. 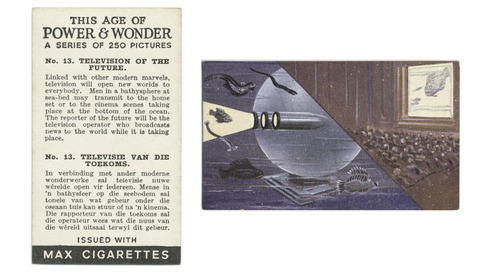 Early visions of television often imagined live broadcasting without any narrative arc, like from this 1930's collectible card that we looked at a few months back.